Katharine Hayhoe with (left) WISL's Christina Marvin, and (right) Bassam. High School Presentation: 10:30 a.m.
Middle School Presentation: 1:00 p.m. Communicating Your Science Beyond Your Field – In Lay Language! What info are you really sending? What are people receiving? The University of Michigan-Flint Chamber Singers join the Festival Choir of Madison for this special performance. Flint, Michigan has become a symbol of how social and environmental justice (and injustice) are intertwined. We welcome the University of Michigan-Flint Chamber Singers, under Dr. Gabriela Hristova, to join with us in presenting recent music that gives voice to the tragedies of the past and present, the promise of social equality and inclusion, and hope for the future of both our society and our planet. Engage in hands-on activities and discussion you can use to introduce climate science concepts into the topics you already teach. Climate science is complicated, but it is based on fundamental concepts from our more familiar sciences. So the complexity offers opportunities to integrate climate science into teaching the concepts already included in your courses. This workshop is designed to help you see how to fit climate science into what you are already doing. The hands-on activities focus on the properties of water (including phase change, heat capacity, solubility, and acid/base chemistry) and how these properties of Earth’s bodies of water are affected by human-caused increases in atmospheric greenhouse gases, especially carbon dioxide, and the resultant global warming. Many of the activities will be directly usable or easily adaptable for use in your classroom. All the written and projected materials will be available to you electronically for use in your classrooms. Madison Symphony Orchestra League "Party of Note"
(AAAS President, former FDA Commissioner), her father David Hamburg (former AAAS president, former president Carnegie Corporation, former chair NSF Advisory Committee on science and engineering education when Bassam was NSF chief education officer), Shirley Malcolm (AAAS Director, Education and Human Resources Programs, former member National Science Board). Julia Rottmayer performed "Songs of Discovery," composed by Julian Pozniak The show closed with John Berry on the viola, joining Vincent and Mimmi for "Two Songs, Op. 91"
Performances at 3:30 & 7:30 p.m. Featuring work by: Steve Anderson, Dennis Briening, Tracy Drier, Jim Hodgson, Amy Lemaire, Robert Ponton, Sally Prasch and Michael Souza. 1:00 p.m. & 4:00 p.m. The Wisconsin Initiative for Science Literacy is pleased to announce another series of workshops for high school science teachers and first-year college science faculty. WISL aims to enrich excellence in classroom activities and is offering two workshops on Climate Science in the Fall of 2018. Hands-on activities are held from 11:00 am to 3:00 pm in the Blue Wing, Lower Level. Professor Shakhashiri's presentations are in Cahners Theater, Blue Wing, Level 2, at 1:00 and 3:00 pm. Members of the Andover High School Chemistry Club from Andover High School with Bassam (from left to right): Justin Dao, Aadith Arasu, Adam McKnight, Duc Vu, Henry Dao, Jenny Shen. OMG, I did not see that! The science of missing what is right in front of your eyes. This talk is free but pre-registration is required. "You have inspired her to want to learn even more about Science. Thank you so much for coming to the library and making a difference in her life." County Executive Joe Parisi, Instructor Bassam Shakhashiri. Watch a video of this presentation! Friday: Science is Fun Exploration Stations, 5-8 p.m.
Saturday: Science is Fun Exploration Stations, 4-8 p.m.
PEOPLE is a college prep scholarship program for students of color and low-income students, most of whom are the first in their families to potentially attend college. Their journey prepares them to apply, be successfully admitted and enroll at the University of Wisconsin System institutions. The Midwest Professional Karate Camp group enjoyed the Science is Fun demonstration. Becky Brockman-Schneider, Holly Cohn, Wendy Crone, Mark Golbach, Ching Kung, Sue Medaris, Vickie Pierce, Jordan Siegler, and Elizabeth Way. Photos by Samantha Haas With Burke Pinne, a student from Bassam's 2005 chemistry class. Sunday's Youth Orchestra portion of this concert will feature Isabelle Krier on violin, who was a guest at the 2017 Once Upon a Christmas Cheery, In the Lab of Shakhashiri. Opening reception January 25, 5-7:00 p.m.
10:00 a.m. & 1:00 p.m.
11:30 a.m. & 12:30 p.m.
You can listen live on 88.7 FM in South Central Wisconsin or stream the broadcast here. Learn more about Wisconsin Youth Symphony Orchestras here. On Saturday, April 7 this event is free and open to the public. An interdisciplinary group of UW scholars, Randall Brown (Medical School), Susan Lederer (Medical History and Bioethics), and Amy Gilman (Chazen Museum of Art), come together to discuss the current opioid epidemic, which is making headlines nationally, in Wisconsin, and in Madison. Moderated by Steve Paulson. Rodney Schreiner, Bassam, and Jerry Bell. Bassam is presented with the 2018 Grady-Stack Award by 2018 ACS President and UW Alumnus Peter Dorhout (PhD '89), Chair of the ACS Committee on Public Relations and Communications Jennifer Maclachlan, and ACS Director-at-Large Wayne Jones. Richard Zare, Jerry Bell, and Bassam. WISL Undergraduate Intern Haley Olsen won "Demonstrator Extraordinaire"
Is the Scientific Method a Myth? The main themes of this historical drama are the intense rivalry of two powerful Cardinals for the Papacy, and their compelling need to control the politically toxic Galileo, a person they otherwise appreciate and admire. Galileo is subtly siding with both Cardinals, but the best he can get for himself is permanent house arrest, a virtual burial alive. The play is relevant in our world, where widespread anti-science beliefs cause societal conflict, regressive governmental actions are common, and freedom of expression is not assured. Leo-Leo Galileo is presented by Playwrights Ink of Madison, in cooperation with the UW-Madison Retirement Association, the Wisconsin Academy of Sciences, Arts & Letters, and the Wisconsin Initiative for Science Literacy. Dr. Renee Frontiera (U of Minn.) discusses the Universal Indicator. Now that's a hot book! Bucky and the ammonia fountain. glows in black light! Carbon dioxide gas extinguishes the candle flames. color-changing liquids. Isabelle also plays the violin. Santa gives Bassam Van Gogh's Sunflowers, which was created using cadmium paints. It was another great year! These Daisy Girl Scouts from Argyle, led by Jody Moen, enjoyed the show. Bassam wears one of Santa's gifts: a Science is Fun bowtie! Admission to the museum is required. Free tickets to Dr. Shakhashiri’s show will be available on a first come, first serve basis. Tickets are available via advance reservation. To reserve tickets, please contact the NESACS secretary via email secretary@nesacs.org before October 10, 2017. Tickets will be available for pick-up in the lobby of the museum at the ACS table. Do You See What (Eye) See? Attendees of the 254th ACS National Meeting & Exposition in Washington DC had an opportunity to attend a lecture on the chemistry of drinking water by Dr. David Sedlak, Editor-in-Chief of Environmental Science & Technology and Environmental Science & Technology Letters. The lecture provides a tour of the U.S. through five very different glasses of drinking water, exploring the chemistry that determines the quality and availability of drinking water in each city. Dr. Sedalk’s lecture was seen live by more than 900 people. An exhibition showcasing works by six Wisconsin artists whose visual impairments inspire and enrich their art. Opening Reception: January 27th, 5:00-7:00 p.m.
at the post-march gathering on Library Mall. WISL was a conference partner and participated in the exhibition, with a Science is Fun table staffed by Gery Essenmacher. An evening with three fellows of the Wisconsin Academy whose explorations in science have been aided by their imaginations. Events at 11:30 a.m. & 12:45 p.m.
"Telling Stories About Science Through the People It Touches"
Sunda, April 2: Public engagement and science literacy, a talk by Bassam Shakhashiri for the symposium "Celebrating Chemistry through Outreach: Honoring the legacy of Christine Jaworek-Lopes"
Monday, April 3: Once Upon a Christmas Cheery In the Lab of Shakhashiri: Public Engagement for 47 Years and Counting, a talk by Bassam Shakhashiri in the symposium "Chemistry through the Eyes of Non-Chemists: Evolution of the Public Perception of Chemistry"
Tuesday, April 4: ACS action needed to influence attitudes and behavior on climate change, a talk by Bassam Shakhashiri for the symposium "Science & Perception of Climate Change"
San Houston State in the fall) attended Bassam's Monday talk. Join the Chemistry 350 participants as they showcase their favorite demonstrations! Now in its 47th year! Saturday, December 3 at 1:00 p.m.
Sunday, December 4 at 1:00 & 4:00 p.m.
Watch the 2016 program online now! For only the third time in their careers, WYSO alumni Kenneth Woods and Cynthia Woods (son and daughter of Claude Woods) will be performing on the same stage. Tickets are $10 Adult, $5 Youth (18 & under), available at the door 45 minutes prior to the concert. Visit wisconsinsciencefest.org for more event information. 5-volume book series, "Chemical Demonstrations: A Handbook for Teachers of Chemistry." on Tuesday, September 6, in honor of the 2016 Kavli Prize Laureates. pose with Prof. and Mrs. Leiv Sydnes, who are wearing traditional Norwegian dress. The Kavli Prizes recognize scientists for pioneering advances in our understanding of existence at its biggest, smallest, and most complex scales. Presented every two years, each of the three international prizes consists of $1 million. Laureates are chosen by committees whose members are recommended by six of the world's most renowned science societies and academies. An exhibit exploring how vision research and the artistic eye align in artworks created or collected by members of the McPherson ERI. Opening Reception: June 22nd, 5:00-7:00 p.m.
Livestream begins promptly at 7:00 p.m. Opening Reception: January 27th, 5-7:00 p.m.
Now in its 46th year! Saturday, December 5 at 1:00 p.m.
Sunday, December 6 at 1:00 & 4:00 p.m.
"Sleights of Mind: What the Neuroscience of Magic Reveals About Our Everyday Deceptions"
Ockham's Razors: When is a simpler theory better? The Science is Fun Extravaganza fosters public awareness and appreciation of science and the arts. Join the celebrations with Bassam Shakhashiri, Rod Schreiner, the Madison Youth Choir, Flamenco dancers, and others. Come and experience spectacular demonstrations, charming voices, dynamic dancing, and more at the grand finale of the 2015 Wisconsin Science Festival. Keynote Address: "Chemistry Research and Education for Wisconsin: Opportunities and Challenges"
View George Whitesides' talk, "Problems, Puzzles, and Inevitabilities in Research"
At 5 venues in 5 towns in 5 days 14 researchers & outreachers will be sharing their science insights with folks in Sturgeon Bay, Marinette, Rhinelander, Ashland and Barron. Tuesday & Thursday Nights, 6:00-8:00 p.m. This summer forum on science and society deals with the role of chemistry in our daily lives and with the impact of chemistry on advancing the human condition and assuring the quality of life locally and globally. Selected topics in the fundamentals of chemistry, including chemical composition, structure of molecules, bonding, properties, and reactivity will be introduced. Special emphases will be placed on water quality, atmospheric chemistry, and general energy concepts and principles. An essential part of the course will be engaging chemistry demonstrations and some hands-on activities. Invited speakers from selected areas of specialization will provide a rich perspective on the topics to be discussed. Chemistry 107 is not intended for students who expect to take additional chemistry courses and it does not satisfy any prerequisites for further chemistry courses. Pre-Reqs: No previous chemistry required. Open to the general public for learners of all ages above the age of 17. A science communication workshop for graduate students, by graduate students. Chemist Rod Schreiner will demonstrate the principles of string vibration and sound propagation that influenced Rameau, and music theorist Lee Blasius will explain how Rameau used these principles to construct a comprehensive view of music. The year 2014 marks the 250th anniversary of Jean-Philippe Rameau's death, and celebrations of the composer and music theorist's life are taking place in France and around the world. During the 2014-2015 academic year, the University of Wisconsin-Madison School of Music will join the celebration with a series of public events, consisting of performances and panel discussions. Saturday Shows at 1:00, 4:00 & 7:00 p.m.
Sunday Shows at 1:00 & 4:00 p.m. Featuring hands-on activities, demonstrations, and lab tours. Saturday, February 14th from 11 a.m. to 4 p.m.
Tickets are NOT required to attend the Physics Fair. A special Wisconsin Academy talk that will bring hope for a better Wisconsin in light of climate change. Panelists Mrill Ingram, Chris Kucharik and Steve Carpenter will explore how tools like scenario-building, storytelling, and the arts can help us better envision our role in prospective responses to climate change. Free and open to the public with advance registration. "Science is Fun and the Joy of Learning"
The School of Music presents Rediscovering Rameau, a series of free events celebrating the works and music of French composer Jean-Philippe Rameau. 8:00 am. - 5:15 p.m. Photos above courtesy of Amahl Drake and Libby Dowdall. of Education (right) with Bassam at the San Francisco meeting. For the Benefit of Earth and Its People"
Thank you for your wonderful seminar tonight at Hope College before a packed auditorium! Your enthusiasm for science and learning is infectious. All the kids, young and "not-so-young", enjoyed it and learned something new! My brain has indeed changed. Several photos are attached, in commemoration of your talk. We look forward very much to your continued visit and seminar about "Enlightenment" on Friday. Thank you also to Jim Gentile, Donna Sova, Mike Pikaart, Graham Peaslee, and audience-participant Mike Seymour for helping make this event such a success! "Bucky Badger and the Joy of Learning"
Monday, March 17, 8:00 a.m.
Wednesday, March 19, 8:30 a.m.
Keynote Speech—"Education: Opportunities and Our Responsibilities In and Out of the Classroom"
SoundWaves: Wood You Could You? Bassam kicks off the show by igniting some balloons, always a crowd pleaser. Lecture demonstrator Jim Maynard performs the N2OCS2 demo in the dark. "Let me just check the instructions for the next demonstration in this book ..."
The Briggs-Rauscher Reaction features dramatic color changes. Prof. Marc Fink and Hinano Ishii visit the lab for a musical interlude. Dr. Rodney Schreiner has collaborated on 43 of the 44 Christmas Lectures. A Wisconsin Academy panel discussion, exploring strategies for cultivating resilience in the face of rapid change. "Climate Change and You: Facts, Challenges, and Responsibilities"
Share your thoughts and pictures with the ACS on Campus community on Facebook and Twitter. Give us a shout-out with @ACSonC and use the hashtag #ACSatUMD. "The Rewards and Responsibilities of Freedom"
An exhibition of Vivian Torrence's collages, from her "Chemistry Imagined" project with chemist Roald Hoffmann. Opening reception August 18, 6-8 p.m.
chemistry teacher and UW Alumni. Featuring performances with Marc Vallon and Richard Lottridge, bassoon; Linda Bartley and James Smith, clarinet; Daniel Grabois and Douglas Hill, horn; and students in the oboe and bassoon studios. Join us for a Science is Fun Extravaganza, put on by Prof. Shakhashiri as part of the 2012 festival! "Our Energy Future: Science and Technology Challenges of the 21st Century"
Grand Opening Celebration for "Global Warming: Facts and Our Future"
This state-of-the-art, interactive exhibit was originally designed by the National Academy of Sciences for the Koshland Museum in Washington, D.C. It's launch here celebrates the opening of a new facility at the nature center, and was made possible by a grant from the Madison Community Foundation. Department Colloquium: Science, Lost in Translation? "Color: It's All in Your Head"
"Material Color in 18th Century Color Theory and Practice"
This special talk will be followed by a public reception. Fusion Science Theater's "Race to the Glow"
Shows are at 10:30 a.m. and 12:30 p.m.
Email rsvp@fusionsciencetheater.com to reserve your free tickets! View the poster for more information. The Best of "Once Upon a Christmas Cheery, In the Lab of Shakhashiri"
(editor in chief of the ACS Chemical Biology journal). At the Fun with Chemistry camp, each day begins with exciting chemistry demonstrations during the general assembly, followed by two hours of laboratory experiments, and a period of group discussion. The daily topics include: the elements; acids and bases; ions and chromatography; metals and alloys; and crystals and polymers. In Fun with Inventions Chemistry campers will learn about chemistry and engineering concepts such as heat and temperature, electricity, energy storage, and nanotechnology. They use this new knowledge to create their own inventions and then market them to their peers during presentations the last day of camp. Parents are welcome to attend the presentations. Each day of the Fun with Forensics Science camp participants will gather evidence, learn forensic science techniques, and employ the scientific method to solve mysteries and crimes. Guest speakers from forensic science related careers enhance the program's connection to real-life science. "That's the Way the Ball Bounces"
A donation of $3 for adults and $1 for children is suggested. Reservations are recommended. To reserve your seat please email Info@FusionScienceTheater.org or call (608) 561-1649. "The Many Psychologies of Global Warming"
Science and technology come alive at UW-Madison with an exciting day of hands-on Exploration Stations, intriguing Science Spectaculars, and more. All events are free. This event is part of the UW-Madison Year of the Arts. "The Way the Ball Bounces"
10:00-10:30 a.m. & 11:00-11:30 a.m. Admission to the show is FREE but there is a fee to enter the Children’s Museum. 330 N. Orchard St. at University Ave. and Campus Dr.
Science is Fun Presentation: 6:00 p.m.
Join WISL for an evening of fun, learning about the science behind fireworks and then enjoy viewing Rhythm and Booms from across the lake after dark. Featuring Professor Bassam Shakhashiri, Dr. Rodney Schreiner and Prof. Mike Leckrone with the UW Band. It's More Than Just a Day! This event precedes the 2009 Wisconsin Science Olympiad on April 10 and is open to Science Olympiad teams competing at the tournament. "Agent-Centered Science and Science Communication"
Location information can be found here. 8:30 a.m. & 2:00 p.m.
Pollan's book, "In Defense of Food: An Eater's Manifesto," has been selected for UW's Go Big Read Program. of the Wisconsin Initiative for Science Literacy. 1200 John Q. Hammons Dr. Professor Shakhashiri joined host Ira Flatow, author Theo Gray and other guests to discuss science demonstrations that are safe to try at home, as well as those that should only be performed by the experts. More information on the science fireworks can be found here. Click here for a photo from a previous Science of Fireworks presentation and here for a photo from this presentation. "Creation of Life: The old way and the new ..."
Microbial Sciences Building, 1550 Linden Dr.
To view the poster, click here. The Department of Chemistry is hosting this open house in conjunction with Alumni Weekend. Included will be many hands-on activities for kids, teens and adults. A list of workshops can be found here. For more information, contact Phill Bloedow at 262-1483 or bloedow@chem.wisc.edu. Professor Wesley Smith will lecture on the the real science of animatter, the CERN Large Hadron Collider and the excitement of particle physics research. Noon to 4 p.m. - Explorations Station in the Microbial Sciences Building and the Biochemistry Addition, both located near the intersection of Linden Dr. and Babcock Dr.
throughout the state click here. Science in the "Obama Era"
A musical performance by science faculty, students and colleagues. Dennett is a prominent American philosopher whose work centers on philosophy of mind, science and biology. He is co-director of the Center for Cognitive Studies and the Austin B. Fletcher Professor of Philosophy at Tufts University. Dennett is a noted atheist and advocate of the Brights movement, and frequently debates religious advocates in a variety of settings. He is author of Breaking the Spell: Religion as a Natural Phenomenon, arguing for the evolutionary origins of religious belief. For a picture from this event demonstrating density click here. Additional information, including information about tickets can be found at the Wonders of Physics Homepage. Click here to view the poster of this event. As director of the Hayden Planetarium and the new host of the PBS magazine "NOVA Science NOW", Dr. Tyson is one of the most high profile astrophysicists in America. He hopes to use the state-of-the-art Hayden to capture the scientific curiosity of a new generation of young people. His recent books include "One Universe: At Home in the Cosmos", "Death by Black Hole: And Other Cosmic Quandaries", and "Origins", the companion book to his acclaimed four-hour miniseries on the PBS program "NOVA". An article about the premiere can be found here. Wisconsin Chamber Orchestra's free program with oboist Naomi Bensdorf. The evening will include an instrument "petting zoo" and science experiments by Prof. Bassam Shakhashiri and Dr. Rod Schreiner for kids prior to concert. Post-concert fireworks. 1:00 a.m. - 4:00 p.m. Professor Shakhashiri and the Science is Fun crew will be presenting demonstrations twice a day at this year's Kids Expo at the Alliant Energy Center in Madison. Related to "The Color of Iron"
A roundtable discussion with Harold McGee, noted author and science writer, and Madison chefs Tory Miller (L'Etoile Rastaurant) and Tami Lax (Harvest Restaurant). Moderated by Madison writer and restaurant critic Raphael Kadushin. Presented in conjunction with the Center for the Humanities. Just in time for Charles Darwin's 197th birthday, an eminent group of UW-Madison faculty have joined forces to make the case for the iconographic scientist and what they consider to be biology's prevailing central idea. The evidence will be presented at Darwin Day, a day-long public symposium on the UW-Madison campus. Mars will be bigger and brighter than any other time this year. It will be directly opposite the sun in our sky (what astronomers call "opposition") on the 7th of November. Mars observing will be great for nearly a month on either side of these dates. In conjunction with the new exhibition Starry Transit at the Washburn Observatory, MMoCA is presenting informal lectures to provide an opportunity to share ideas about the exhibition. Timothy Moermand, Professor Emeritus, UW-Madison Department of Zoology on bird behavior and migration. Archaeologist Dr. Robert Birmingham, on migratory bird symbolism in ancient Madison-area effigy mounds, including one located next to Washburn Observatory. Please note that the talk will take place outdoors; participants will gather at Washburn Observatory, then walk to the mound. Jill Casid, Assistant Professor, UW-Madison Department of Art History, on Romancing the Instrument: Glowacki's Starry Transit and the History of Scientific Technologies. The year 2005 is the centennial of Albert Einstein's publication of three of the most important discoveries of 20th Century science: the special theory of relativity, the quantum theoretical explanation of the photoelectric effect, and a molecular interpretation of Brownian movement. World-wide celebrations of the centennial include not only the sciences, but visual arts and music as well. 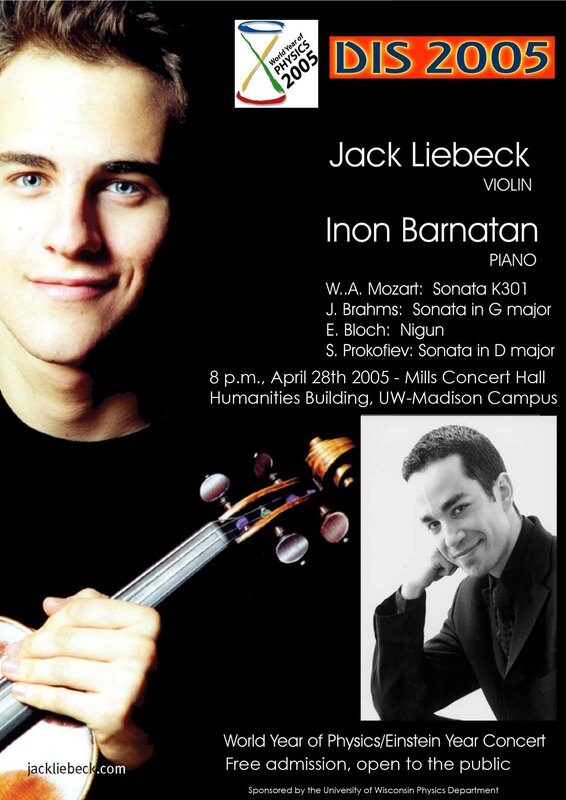 Young British violinist Jack Liebeck and Israeli pianist Inon Barnatan bring their musical offerings to Madison. The concert is free and open to the public. Featuring Nobel Laureate Roald Hoffmann, the Frank H.T. Rhodes Professor of Humane Letters and of Chemistry at Cornell University. Dr. Hoffmann is a chemist and writer of poetry, nonfiction, and plays. Distinguished researchers from the UW-Madison describe their work. Thought-provoking hands-on activities for college, high-school, and middle-school students and their families. Since prehistory gold has embellished some of our finest jewelry, paintings, sculpture, illuminated manuscripts, ceramics, and glass. In contrast, photographic printing has been dominated by silver and, for a brief episode, by platinum. Although a gold-printing process was proposed in 1842 by Sir John Herschel, who dubbed it chrysotype, technical difficulties and expense barred its use. But modern chemistry has enabled the economic making of photographic prints in nanoparticle gold; essentially the same superb pigment known to ceramicists and alchemists since the Renaissance as Purple of Cassius. The New Chrysotype process promises to offer a novel, beautiful, and enduring medium of practice for artist-photographers who hand-make their own prints. Co-sponsored by the Elvehjem Museum of Art and the UW Madison Geology Museum. Click here for an abstract of Philip Ball's talk. Click here for color poster announcement of Philip Ball's talk. Presented in partnership with the Center for the Humanities, and the College of Engineering. Women in Chemistry is a traveling exhibition that showcases women chemists who have helped create our modern world and their historic contributions to science and technology. From the action of atoms to the substance of stars, these women have given us new visions of the material world and our place in it. The traveling exhibition encourages young women to explore possible careers in chemistry by presenting the rich history of women chemists and their contributions to everyday life. Clint Sprott, Professor of Physics, University of Wisconsin Madison. For over 30 years, this science-oriented entertainment has played to packed houses at such varied locations as the University of Wisconsin-Madison, the National Academy of Sciences and the Smithsonian's National Air and Space Museum in Washington, and Boston's Museum of Science, and it has been televised by stations across the country. Explore the nature of creativity in the complicated group dynamics of the opera with UW Opera Director William Farlow. With over 200 productions to his credit, and a long career that has taken him to Scotland, Mexico, Canada, and throughout the United States, Farlow has directed productions for the Lyric Opera of Chicago, Los Angeles Opera, and the Canadian Opera. He has worked with such artists as Placido Domingo, Kiri Te Kanawa, Carlo Maria Giulini, and painter/set designer David Hockney. As a singer, he has performed major roles in canonical operas, as well as principal roles in nine Gilbert and Sullivan operettas. In addition to his duties as opera director, he teaches voice and stage direction. Professor Farlow earned his Bachelor of Music in Theory and Composition from the University of Texas at El Paso and his MM in Opera from the University of Texas at Austin. UW-Madison alumnus Carl Djerassi and his wife Diane Middlebrook can respectively claim responsibility for a dizzying range of accomplishments, including the birth control pill, plays, and biographies such as the tale of Sylvia Plath and Ted Hughes retold in Middlebrook's recent best-seller Her Husband (Viking, 2003). As a part of the 2004 Wisconsin Book Festival, this fascinating couple join for a conversation about science, literature, and art. Presented in partnership with the Center for the Humanities. E. Gorham and Butler St. In the context of one of the oldest synagogues in North America, Ron Numbers will discuss the role of creativity in the formation of a science independent of religion. Professor Numbers teaches and writes about the history of science, medicine, and religion in America. He is currently writing a one-volume history of science in America since European settlement, and with colleague David Lindberg, he recently completed editorial work on the eight-volume Cambridge History of Science (Cambridge University Press, 2003). His numerous additional works include The Creationists (Knopf, 1992), Darwinism Comes to America (Harvard University Press, 1998), and Disseminating Darwinism: The Role of Place, Race, Religion, and Gender (Cambridge University Press, 1999). Professor Shakhashiri has organized a special presidential event at the American Chemical Society national meeting August 22nd, designed to combine science, the arts, and the humanities. Notable scientists and authors explained how they use theater, poetry, photography and other tools to communicate science to the public. Colleague, mentor, and friend, Hyuk Yu, retired after 36 years at the University of Wisconsin-Madison in January 2004. In honor of this occasion, the department of Chemistry has organized a symposium celebrating his years of research and teaching. The symposium will include 21 invited talks, and accompanying the symposium will be a banquet and a picnic. Madison Repertory Theatre and Theater Department actors read from a play, by Chiori Miyagawa, about the life and career of astronomer Caroline Herschel. Panel discussion with playwright follows. Science Expeditions is a month-long series of science outreach events on Campus for the general public. Pulitzer Prize winner and author of the best-seller "Guns, Germs and Steel"
Click here for information from the June 22, 1999 Larry Meiller Show. 733 N. High Point Rd. American Premiere Reading of "NO"